Whoever isn’t speaking is often not fully listening to what is being said because they’re thinking about something they want to say themselves. Modeling and supporting social learning during the session. Design the session to build on relevant expertise and experience uncovered by each pair-share. Finally it’s worth mentioning that pair share can be used as a tool for introductions. Invite everyone to pair up with someone they don’t know and have each person take a minute to introduce themselves to their partner. Pair share is quick, simple, versatile, and effective. Use it! How do you use pair share? Share with everyone in the comments below! I guarantee you will learn many new great ideas about conference panels from this Blab of my Thursday chat with the wonderful Kristin Arnold. I’ve annotated it so you can jump to the good bits . (But it’s pretty much all good bits, so you may find yourself watching the whole thing. Scroll down the whole list; there are many advice gems, excellent stories and parables, folks show up at our homes, Kristin sings, etc.!) With many thanks to Kristin and our viewers (especially Kiki L’Italien who contributed mightily) I now offer you the AMA About Conference Panels annotated time-line. [Before I turned on recording] We talked about: what panels are and aren’t; the jobs of a moderator; panel design issues; some panel formats; and our favorite panel size (Kristin and I agree on 3). [0:00] Types of moderator questions. [1:30] Using sli.do to crowdsource audience questions. [4:30] Audience interaction, bringing audience members up to have a conversation; The Empty Chair. [6:00] Preparing panelists for the panel. [9:10] Other kinds of panel formats: Hot Seat, controversial topics. [12:00] Continuum/human spectrograms/body voting and how to incorporate into panels. [14:40] Asking panelists for three messages. [16:30] How the quality of a moderator affects the entire panel. [17:30] More on choosing panelists. [18:30] How to provoke memorable moments during panels; Kristin gives two examples involving “bacon” and “flaw-some“. [20:30] Panelist homework. Memorable phrases: “The phrase that pays“; Sally Hogshead example. [23:00] Panelists asking for help. Making them look good. [24:10] Warming up the audience. The fishbowl sandwich: using pair-share as a fishbowl opener. [25:30] Other ways to warm up an audience: pre-panel mingling, questions on the wall, striking room sets. [26:30] Meetings in the round. [28:00] Kristin’s book “Powerful Panels“, plus a new book she’s writing. [29:00] Pre-panel preparation—things to do when you arrive at the venue. [30:00] Considerations when the moderator is in the audience. [31:00] Panelist chairs: favorite types and a clever thing to do to make panelists feel really special. [32:50] Where should the moderator be during the panel? Lots of options and details. [36:20] A story about seating dynamics from the late, great moderator Warren Evans. [37:50] The moderator as consultant. [39:40] Adrian explains the three things you need to know to set chairs optimally. [41:00] “Stop letting the room set being decided for you,” says Adrian, while Kristin sees herself as more of a suggester. [44:40] When being prescriptive about what you need is the way to go. [46:30] Ideas about using screens at panel sessions. [49:00] The UPS truck arrives at Adrian’s office door! [53:40] American Idol panel format. [55:50] Control of panels; using Catchbox. [56:20] Ground rules for the audience. [59:10] What to say and do to get concise audience comments. [1:00:00] A sad but informative story about a panelist who insisted on keeping talking. [1:03:20] The Lone Ranger Fantasy. [1:04:00] The moderator’s job, when done well, is pretty thankless. [1:06:10] The end of the fishbowl sandwich. [1:07:40] Room set limitations caused by need to turn the room. [1:10:00] Language: ground rules vs covenant; “Can we agree on a few things?”; standing to indicate agreement. [1:13:00] You can’t please everyone. [1:14:20] Kristin breaks into song! [1:15:00] Non-obvious benefits obtained when you deal with an audience’s top issues. [1:15:50] Why you should consider responding to unanswered attendee questions after the panel is over. [1:16:40] The value (or lack of value) of evaluations. [1:18:00] Following up on attendee commitments. [1:20:00] Immediate evaluations don’t tell you anything about long term attendee change. [1:25:00] Kristin’s process that quickly captures her learning and future goals; her continuous improvement binder. [1:26:40] Closing thoughts on the importance of panels, and goodbye. I’m in San Antonio, Texas, having just run two 90-minute “panels” at a national association leadership conference. I say “panels” because at both sessions, the three “panelists” presented for less than five minutes. Yet after both sessions, participants stayed in the room talking in small groups for a long time—one of my favorite signs that a session has successfully built and supported learning, connection, and engagement. You may be wondering how to effectively structure a panel where the panelists don’t necessarily dominate the proceedings, letting attendees contribute and steer content and discussion in the ways they want and need. There’s no one “best” way to do this of course, but here’s the format I used for these two particular sessions. Each session was designed to discover and meet wants and needs of the executive officers and volunteers of the association’s regional chapters’ members in an area of special interest. The first session focused on a key fund-raising event used by all of the participants, while the second covered the more general topic of chapter fundraising and sponsorship. Room set has a huge effect on the dynamics of a session. Previous sessions in our room had used head tables with table mikes and straight row theater seating (ugh; well, at least it was set to the long edge of the thin room.) I had the tables removed, the mikes replaced with hand mikes, and the chairs set to curved rows with plenty of aisles so that anyone could easily get to the front of the room to speak (see below). After a brief welcome and overview, I began a four-chair fishbowl sandwich format, which turns every attendee into a participant right at the start, and ensures that they end participating too. Check the link for a description of this simple but effective way to bring participation into a “panel”, and to understand how fishbowl allows control over who is speaking by having them first move to a chair at the front of the room. give everyone a sense of the distribution of chapter sizes represented. other issues related to the session topic. I also gave participants the opportunity to ask for additional information about their peers in the room. This is another powerful way for participants to discover early on that they can determine what happens during their time together. I used appropriate participatory voting techniques (see also here, and here) to get answers to the multiple requests that were made. Several weeks before the conference, I scheduled separate 30-minute interviews with the six panelists to educate myself about the issues surrounding the session topics and to discover what they could bring to the sessions that would likely be interesting and useful for their audience. After the interviews were complete, I reviewed our conversations and determined that each panelist could share the core of their contributions in five minutes. So I asked each panelist to prepare a five-minute (maximum!) talk that covered the main points they wanted to make. During the first session I brought up the panelists to the front of the room individually. As each panelist gave their talk, I allowed questions from the audience, and, as I should have expected, each panelist’s five minutes expanded (by a few minutes) as they responded to the questions. So for the second session, I tried something different. All three panelists sat together with me, and I asked the audience to hold questions until all three had finished. Each panelist gave a five-minute presentation, and then I facilitated the questions that followed. In my opinion, having only one panelist at the front of the room at a time creates a more dynamic experience. But on balance, I think the second approach worked better as there was some overlap between what the panelists shared, and when questions ended there was a more natural segue to the next segment of the session. At this point we switched to a fishbowl format. I had the panelists return to front row audience chairs, from where they could easily return to the “speaking” chairs. (They were frequent contributors to the discussions that followed.) I identified some hot issues, listed them for participants, and then invited anyone to sit in one of the three empty front-of-the-room chairs next to me to share their innovations, solutions, thoughts, questions, concerns, etc. Anyone wishing to respond or discuss joined our set of chairs and I facilitated the resulting flow of conversation. Some of the themes I suggested were discussed, but a significant portion of the discussion in both sessions concentrated on areas that none of my panelists had predicted. The capability of fishbowl process to adapt to whatever participants actually want to talk about is one of its most attractive and powerful features. If I had used a conventional panel for either session, much more time would have been spent on topics that were not what the audience most wanted to learn about, and unexpected interests would have been relegated to closing Q&A. During my opening overview of the format, I explained that we might have time for some consulting on a participant’s problem towards the end of the session. We didn’t have time for this during the first session — given a break, we could have probably taken another hour exploring issues that had been raised — but we had a nice opportunity during the second session to consult on an issue for a relatively new executive officer. Another option that I offered, which we didn’t end up exploring in either session, was to share lessons learned (aka “don’t do this!”) — a useful way to help peers avoid common mistakes. With a few minutes remaining, I closed the fishbowl and asked participants to once again form pairs and share their takeaways from the session. The resulting hubbub continued long after the sessions were formally over, and I had to raise my voice to thank everyone for their contributions and declare the sessions complete. When an audience collectively has significantly more experience and expertise than a few panelists — as was the case for these sessions (and a majority of the sessions I’ve attended during forty years of conferences) — well-facilitated formats like the one I’ve just described are far more valuable to participants than the conventional presentations and panels we’ve all suffered through over the years. Use them and your attendees will thank you! 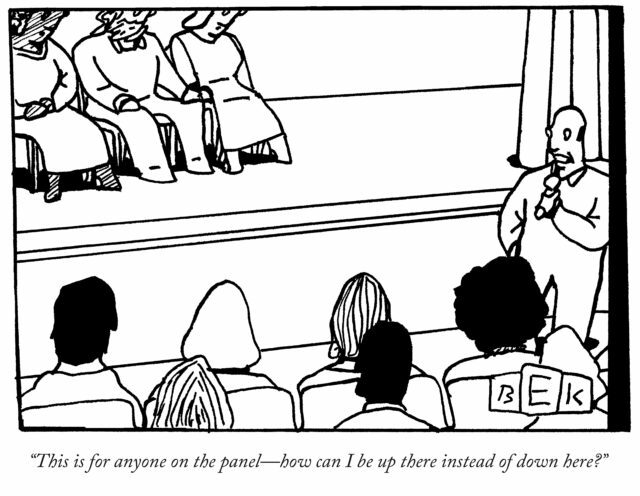 At the conference sessions I design and facilitate, everyone is “up there” instead of “down here.” Yours can be too! To learn how to build sessions that build and support learning, connection, and engagement, sign up for one of my North American or European workshops.